Journalisted is an independent, not-for-profit website built to make it easier for you, the public, to find out more about journalists and what they write about. It is run by the Media Standards Trust, a registered charity set up to foster high standards in news on behalf of the public, and funded by donations from charitable foundations. Each week Journalisted produces a summary of the most covered news stories, most active journalists and those topics falling off the news agenda, using its database of UK journalists and news sources. This entry was posted in Journalism, Newspapers, Online Journalism and tagged Dominique Strauss-Kahn, Journalisted Weekly, privacy, Queen on May 25, 2011 by Sarah Booker. This entry was posted in Citizen journalism, Editors' pick, Newspapers, Online Journalism and tagged Amber Campbell, American University, Anne View, E&P Pub, Freemont Universe, Justin Carder, Kate Bergman, Magnolia Voice, networked journalism pilot project, Queen, S. and James L. Knight Foundation, Seattle, Seattle Times, the institute for interactive journalism, the Rainier Valley Post, the Seattle Times, Tracy Record on August 27, 2009 by Judith Townend. Shiny Media, the UK blog network that went into administration last month, has sold its fashion sites to Bright Station, an original backer of the company. Catwalk Queen, Kiss and Make Up, Bag Lady, Shoewawa, Crafty Crafty, Dollymix, Trashionista, Shiny Gloss, Star Trip and Nollie have been bought up by Bright Station’s new vehicle Aigua Media Limited, reports TC UK. The remaining Shiny titles remain with Shiny Digital Ltd, which bought Shiny Media straight after it was announced that it was going into administration. This entry was posted in Editors' pick, Social media and blogging and tagged Aigua Media Limited, blog network, blogging, blogs, Bright Station, editor, Kiss, Ollie Irish, Queen, Shiny Digital Ltd, Shiny Media, TechCrunch UK, uk, United Kingdom on August 14, 2009 by Laura Oliver. As reported on the main site [“Telegraph ‘didn’t tell any lies but was selective in its facts’ – says Lib Dem Voice site editor“] several MPs, or others on their behalf, have voiced various concerns in regards to claims about their expenses in the Daily Telegraph, and subsequently reproduced in other stories by other media organisations. Update: the Press Complaints Commission (PCC) has confirmed that it has not received any complaints from MPs over stories about expenses to date. Generally, third parties cannot complain on the first party’s behalf. Issues raised on Quaequam blog by James Graham [he discloses that he is a friend of Swinson’s] and other Liberal Democrat blogs, e.g. Mark Reckons. 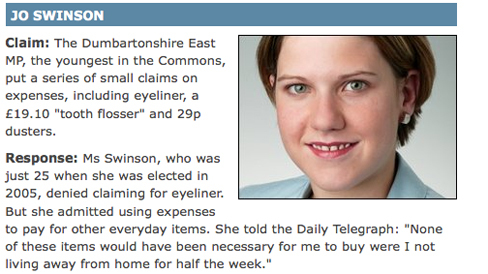 Swinson denies claiming for eyeliner or other cosmetics and dusters but said they were included on the same receipt as items she did claim for. Issues raised on the Liberal Democrat Voice website in a piece by Alix Mortimer and also by George in media interviews: the MP claims that he owns a third of the flat in question, it is for his use, and is only used by his daughter occasionally. In the same piece (see above) on the Liberal Democrat Voice website, Mortimer claims that unfair criticisms were made of Reid’s B&B expenses: she argues that the size of his Scottish constituency, and the number of islands within it, more than justifies the money spent. Other pro-Lib Dem bloggers, Andrew Reeves and Stephen Glenn make similar points. The VentnorBlog reproduces Turner’s response to the Telegraph the day before publication. It shows that Turner denied claiming for life coaching for his girlfriend, stating that it was for another member of staff in his office. Turner also responds to the allegations on his site. Issues raised on OUuseful.info. Gloucestershiretoday.co.uk has published an article reporting that the Telegraph apologised to Horwood for stating that he had claimed mortgage interest in parliamentary expenses. Telegraph.co.uk, May 19, 2009: the online version currently states that Horwood claimed for ‘rent;’ it is not clear if that is a later amendment after the claim made in the print version; the Telegraph did not provide further information in regards to whether, of if any correction had been made, when requested. This entry was posted in Journalism, Newspapers, Press freedom and ethics and tagged Alan Reid, Alix Mortimer, Andrew George, Andrew Reeves, Andrew Turner, BBC, Conservative MP, Daily Mail, Gloucestershiretoday.co.uk, Isle of Wight, Isle of Wight The VentnorBlog, James Graham, Jo Swinson, Journalism.co.uk, Lib Dem, Liberal Democrat, Liberal Democrat MP, Mark Reckons, Martin Horwood, media organisations, online version, pence, Press Complaints Commission, Queen, spokesman, St Ives, Stephen Glenn, Telegraph.co.uk, the Daily Telegraph, the Isle of Wight, the Press Complaints Commission, the Telegraph, Voice site editor on June 11, 2009 by Judith Townend. A fuller account [from Wednesday] of the speech made by Rusbridger at Queen Mary, University of London on Tuesday. Rusbridger talks about open-source journalism, the tax gap series and the paper’s use of social media. This entry was posted in Editors' pick, Events, Online Journalism and tagged Alan Rusbridger, guardian, Guardian.co.uk, Jemima Kiss, Mary, Queen, social media, The Guardian, Twitter, University of London on May 1, 2009 by Judith Townend. Here, in yesterday’s lecture at Queen Mary, University of London, part of the university’s Art Week 2009. He says reading Clay Shirky, Adrian Monck, Jeff Jarvis and the Niemen Foundation, via Twitter, is like receiving a personalised wire feed on the world’s press each morning – a service you’d have paid a consultant a lot of money for, in the past. Alan Rusbridger on the Future of Journalism from Carta on Vimeo. This entry was posted in Editors' pick, Events, Newspapers, Online Journalism and tagged Adrian Monck, Alan Rusbridger, Berlin, Clay Shirky, consultant, editor-in-chief, fantastic journalistic tool, fantastic marketing tool, guardian, Institut für Medienpolitik, Jeff Jarvis, Mary, Mary University, Niemen Foundation, Queen, Queen Mary University, The Guardian, Twitter, University of London on April 29, 2009 by Judith Townend. Following on from their live coverage of a day in the paper’s offices, the Liverpool Daily Post are once more experimenting with liveblogging to cover a royal visit to the city. The Post is using service CoveritLive to report on the visit and provide rapid, real-time updates on what’s happening. This is a strategic operation reporters and videojournalists, who are stationed at different positions to capture the visit, posting updates and links to multimedia coverage. Lessons learned from the previous experiment have been put into practice this time around and it’s attracting plenty of questions and reader reactions. This entry was posted in Multimedia, Newspapers and tagged blogging, CoveritLive, Liverpool Daily Post, Queen, The Liverpool Daily Post on May 22, 2008 by Laura Oliver.